The Madison BioResearch Product Faire™ Event ia An important Wisconsin laboratory science technology and marketing event and will be held this fall on University of Wisconsin Campus that will benefit local university and biotech company researchers in the Madison area. In September of this year Biotechnology Calendar, Inc. will be hosting the 7th annual Madison BioResearch Product Faire™ Vendor Show at the University of Wisconsin Madison. Biotechnology Calendar, Inc. has been bringing life science researchers and laboratory supply vendors together for 19 years now, and the Madison event is expected to draw over 450 U Wisconsin and local area researchers interested in exploring how new life science laboratory products and services can benefit their research programs. 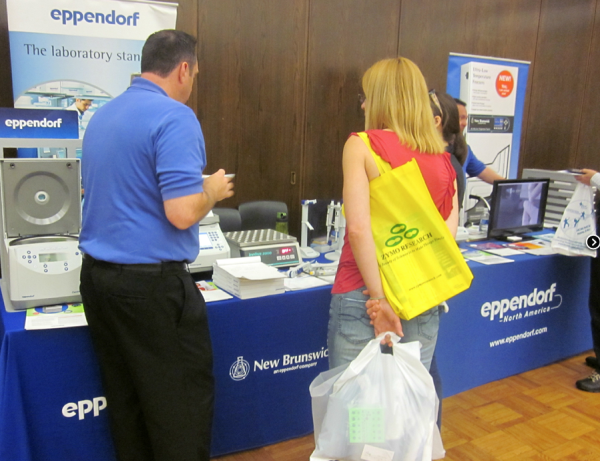 In 2011, the U Wisconsin vendor show attracted over 460 academic and biotechnology researchers in search of Wisconsin laboratory products. Based on exhibitor surveys collected at the event, each exhibitor had an average of 70 attendees view their products and demonstrations. Out of this total, exhibitors reported an average of 10 quality leads. Exhibitors reported an average product value of over $3,000. 16 researchers from Animal Sciences. 17 researchers from Biomed Engineering. 15 researchers from Biomolecular Chemistry. With $1 Billion in research conducted yearly at the University of Wisconsin, Madison, it is the 2nd highest-funded public university in the country and a competitor with Stanford, MIT and Michigan in attracting top research faculty and grants (see our blog here for the full story). 20 Biochemistry Research Labs recently opened in New UW-Madison Complex. The Biochem complex cost over $112M (see our blog here for the full story). If you are a researcher in the Madison area or a laboratory supplier interested in networking with UW Researchers, Biotechnology Calendar, Inc. would like to welcome you to attend the Annual BioResearch Product Faire™ Event on campus at the University of Wisconsin, Madison. This event will take place on September 5, 2012. For more detailed funding statistics for the University of Wisconsin, Madison, click the button below.